Place oven rack in lowest position; heat oven to 350°F. 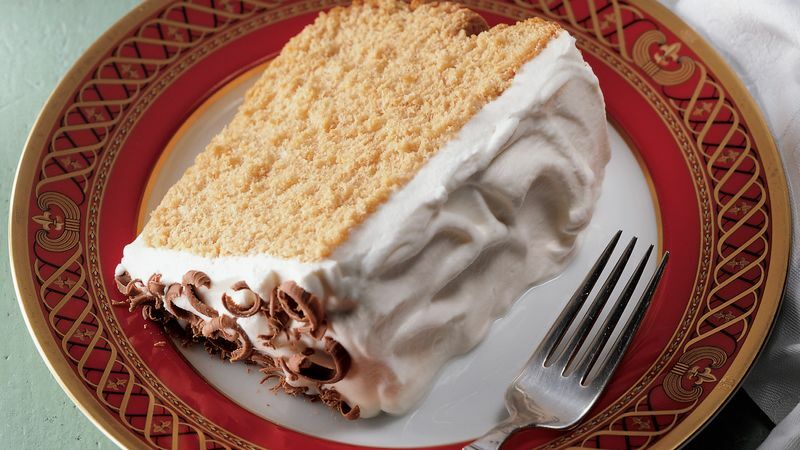 In large glass or metal bowl, combine all cake ingredients at low speed until moistened. Beat 1 minute at medium speed. Do not overbeat; batter may be thin. Pour batter into ungreased 10-inch tube pan. Bake at 350°F. on lowest oven rack for 35 to 45 minutes or until top crust is deep golden brown and cracks are very dry. Cool upside down on glass bottle or heatproof surface for 1 hour or until completely cool. Remove cooled cake from pan. In large bowl, combine all frosting ingredients; beat until stiff peaks form. Frost sides and top of cake. Garnish with grated chocolate. Store in refrigerator. Instant espresso powder is sold in the coffee or gourmet section of the grocery store. Its flavor is slightly stronger than instant coffee. Instant coffee powder can be used in place of the instant espresso powder. However, granulated instant coffee does not work well. For espresso flavor, double the amount of coffee powder. Substitute 4 cups of nonfat frozen whipped topping, thawed, for the whipped cream frosting and save about 15 grams of fat per serving.